More and more spouses who are thinking about divorce, or who are going through the divorce process, are snooping on the other spouse. They’re looking for evidence of adultery, hidden assets, bad parenting, or other information that might give them a leg up in a divorce or custody proceeding. “Snooping” covers a wide range of activities. For instance, it could include accessing a spouse’s private e-mail or social-networking account, looking in a spouse’s smartphone for suspicious phone numbers or texts, or digging through his or her web search history. Some spouses have been known to use methods that are more technologically sophisticated. These can include installing key-logging software on a computer that tracks every keystroke a spouse makes, setting up hidden cameras or recorders, attaching a GPS device to a spouse’s car, or even swapping out a spouse’s GPS device with a similar-looking device that transmits pictures of where the car goes and who’s in the passenger seat. You might be tempted to snoop on a spouse or an ex-spouse, but if you are, it’s absolutely critical to talk to a lawyer beforehand. This is because some of these practices could be illegal and get you arrested. In addition, the fact that you uncovered information illegally could cost you credibility in divorce court, and the evidence you came up with might not even be admissible in court if you obtained it through improper means. If you discuss your concerns and suspicions with your attorney, your attorney may be able to use other methods to obtain the same kind of information without compromising your credibility or your case. 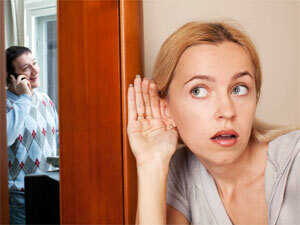 So what kinds of snooping are actually allowed? It’s perfectly legal to do a Google search on a spouse, for example. However, it’s potentially illegal to hack into a spouse’s password-protected smartphone or Facebook page. Although the law varies from place to place and situation to situation, this could constitute a serious violation of someone’s electronic privacy rights. Installing a GPS device or key-logging software might also get you in trouble – especially if it’s not clear that you have sole legal ownership of the car or the computer. Hidden cameras and recording devices can create difficulties, too. They might violate wiretapping and other privacy laws. For example, a man in California who was going through a bitter divorce discovered that his wife had sewn a tiny recording device into his son’s blue jeans. Not only were he and his son recorded, but the device picked up conversations with lawyers, therapists, and members of the man’s family. All these people have now filed lawsuits against the man’s ex-wife, accusing her of violating federal laws against secret tape-recording. In a similar case, a Nebraska woman who sewed a recording device into her four-year-old daughter’s teddy bear now has to pay a significant damages award, plus attorney fees and costs, for violating her ex-husband’s privacy. Computer snooping can also get people into serious hot water. For example, a Michigan man accessed his estranged wife’s e-mail on a shared computer and discovered that his wife – who’d been married twice before – was cheating on him with her second husband. He not only sought to use the information in his own divorce proceeding, but also printed out the e-mails and gave them to her first husband, with whom she was entangled in a custody dispute. The man – who claims he “guessed” the password to her Gmail account – was criminally charged and faces up to five years in prison. If you’re concerned about a spouse’s improper financial, romantic or parenting activities, talk to your attorney. Don’t just take the law into your own hands, or you might wind up on the wrong side of it.